SmartAsset, a startup that offers interactive tools to help with the homebuying process (with plans to expand to expand to other big financial decisions), has raised $900,000 in seed funding. The company is part is of the current class of startups being incubated at Y Combinator. It launched last month, and co-founder and CEO Michael Carvin says that more than 14,000 people who have already started using the site. He adds that SmartAsset is already generating “significant revenue” from advertising and lead generation. As for the funding, it comes from YC, Quotidian Ventures, and New York- and Silicon Valley-based angels. When users come to SmartAsset, they enter their basic financial information, then interact with a number of calculators and charts that help them understand the financial implications of their homebuying choices. The site will recommend a home price that they can afford, provide a graph modeling the rent vs. buy decision, and suggests things that might save users money. The point is to help users perform their own analysis, so they don’t have to follow SmartAsset’s recommendations blindly — for example, if you want to buy a home with a higher price than the one suggested by the site, you can enter that price and the company will show you how that’s likely to affect your finances. 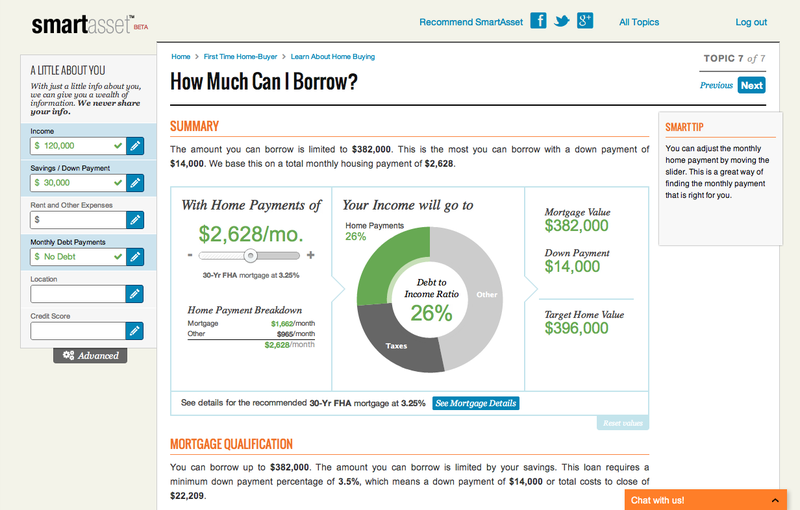 In addition to the user numbers and financing, SmartAsset is also announcing two additions to its homebuying product today — the ability to calculate “How much can I borrow?” and “How much can I put down?” As with all of the company’s tools, the answers change depending on your location (because things like the tax implications change), and you can always adjust the numbers to see how borrowing more or putting down more affects the bigger picture. Carvin says these additions come in response to user demand. “We have a pretty deep product pipeline, but everything gets prioritized based on what our users were actually asking for,” he says.